PRODUCT: SIEVERT # 3200-01 PROPANE QUICK CONNECT/DISCONNECT SET. 9/16-18 LH FEMALE PIPE THREADED, ALL BRASS. UL LISTED. PRICE/SET. DESCRIPTION: COMPLETE SET FOR SIEVERT HANDLE AND HOSE. ALLOWS FAST CONNECTION AND DISCONNECTION OR CHANGE OF SIEVERT TORCH HANDLES WITHOUT TOOLS. Sievert #3488 PRO 88 Dual-Valve Torch Handle. Used with larger / high BTU torches and in TurboRoofer Kits. Price/Each. Sievert #3001-01 LP Gas Male Quick-Connect Fitting. Brass construction. U.L. listed. Mates to 3002-01 fitting. Price/Each. 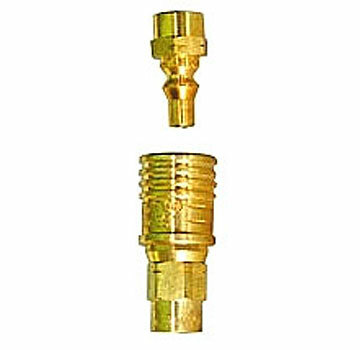 Sievert #3002-01 LP Gas Female Quick-Connect Fitting. Fits Sievert LP Gas Hose. Brass construction. U.L. listed. Used with 3001-01 fitting. Price/Each. SIEVERT CS4460 TURBOROOFER COMBINATION 2-TORCH (18 inch 3444-38 300K BTU and 32 inch 3460-38 375K BTU) PROPANE TORCH KIT FOR ROOFERS. PRICE/KIT.